Stage 2 of The Castles Route to include the route from Llangrove to Skenfrith Castle with loops to Grosmont Castle and White Castle. This is a short, easy ride along quiet lanes with just a few hills but no overly-steep ascents. It is suitable for a family ride with free access to Grosmont Castle on arrival and visitor facilities in the village. The return ride follows the route of the River Monnow along very quiet, almost traffic-free lanes. Leave Skenfrith beside the houses to the left and pass St Bridget's Church on the right. The lane bears to the left, crosses the bridge and runs alongside Black Brook to the left. At the triangular T junction, turn right passing Norton Court farm buildings on the right. Follow this lane, the B4347, for about 4 miles enjoying scenic views of patchwork-fields to the right. The approach to Grosmont is marked by a short but fairly steep ascent into the village. The lane to the castle is on the right. Grosmont Castle probably dates from about 1070 although there is some speculation about its precise origins. It is open at all reasonable times during daylight hours, with no admission charge. Steps lead up towards the tower from which there are views over the village. - shortly followed by a larger stone bridge and then the 'Welcome to Herefordshire' sign along with signs for National Cycle Network (NCN) Route 46. Turn right following the sign to Garway and Kentchurch/Route 46 beside the stone gatehouse on the right. As the road bears sharp right, you will see the signpost following the Sustrans National Cycle Network route back to Skenfrith. Follow the road along NC route 46.
over the stream with mini waterfalls. 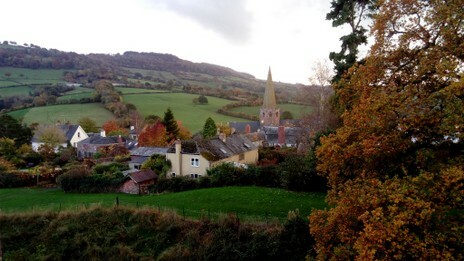 Continue along this quiet country lane for about 2.3 miles, enjoying the rural landscape views to the right following the route of the River Monnow, then prepare for a long and steady ascent as you approach Garway. On reaching the outskirts of the village a short ¼ mile detour can be taken into the village itself. Alternatively, turn right at the sign towards Skenfrith (CNC46) and Garway Church, which is well worth a visit. The long ascent is rewarded by a long descent along this narrow lane which passes Garway Church on the left. Garway Church of St. Michael dates from the 13th century and has a large tower which was once detached from the main church building itself. With its carvings, simple stone slab altar and unusual pink interior, it is well worth a visit. 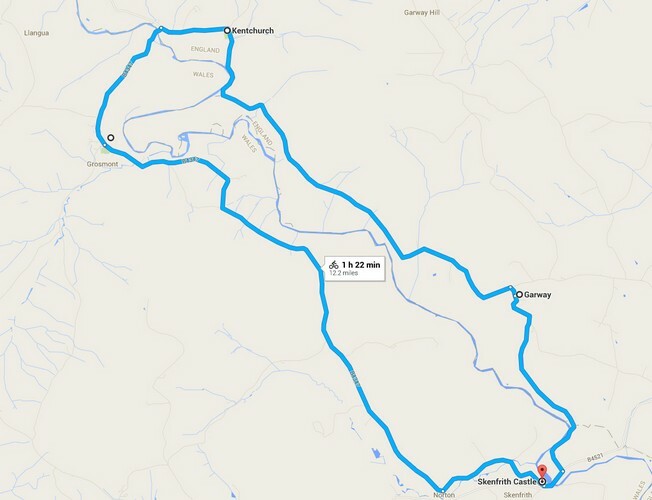 The return ride to Skenfrith is now easy, all downhill along the lane until reaching the T junction with the B4521. Turn right, cross the stone bridge, pass 'The Bell' inn on the left and turn right to Skenfrith Castle to complete the ride.